Every Tuesday and Wednesday during the month of May, we’ll be hosting a gluten-free guest blogger from around the web in honor of Celiac Awareness Month. 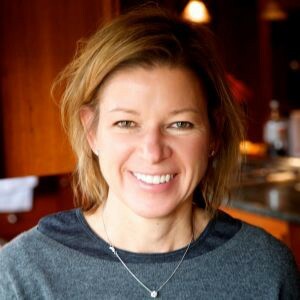 Today we’re pleased to welcome Jamie Eppenauer from Gluten Free Mom, who explores the many ways families can arrive at a gluten-free lifestyle through her own family’s varying shades of gluten sensitivity. This is story of how our family became gluten free. Similar to a lot of families, the individuals in my family each arrived at being gluten free under different circumstances, with different symptoms and different diagnoses. Here is a look at our shades of gluten sensitivity. I am not a doctor, naturopath, nutritionist, nurse or in any way a professional health care provider. I am merely a mom who is raising her family gluten free, and this is our story. I am going to start with my oldest daughter, as she is the one who was first diagnosed with a gluten issue and thus started us down this path of a gluten free life. My oldest daughter, now a healthy, beautiful, vibrant 19-year-old, was once a non-thriving, somewhat depressed, shy and often sick child. I am not sure when the symptoms first started. Looking back, there were several instances that make me wonder if she was born with some level of gluten intolerance. She was a very, very, very colicky baby. Really nothing could calm her down. She had the classic pot belly stomach and, even as a toddler, there were a few instances when she projectile vomited. Plus she just seemed unhappy. Whenever the subtle signs started, by the time she reached third grade her illness became more serious. She always had a stomachache. She drank Pepto Bismal like it was chocolate milk. The doctors attributed it to “school-related stress.” She was frequently constipated. The doctor answered this by saying she needed to pull her underwear all the way to her ankles when she went to the bathroom. And then the flu-like symptoms began. Every two months she would get what seemed like the flu and vomit for almost a week. We took her to the doctor who would run your standard blood tests. They would all come back normal. She was not even anemic. The doctors answered our questions with “it is just the flu; it has been a bad season.” My daughter was so thin you could count her ribs and she had to have IVs to be rehydrated. Finally, when this had been going on for about a year and she had the “flu” for five days in June, I took her to the doctor determined not to leave until we had some kind of an answer. They took stomach x-rays and ran additional blood tests. As an afterthought, the doctor threw in a test for “celiac” – a word we would soon get to know very well. We left to go on a summer trip but all I could do was pray for an easy answer, of course not wanting anything serious. The first round of tests from the blood work came back normal again, but I still had a nagging feeling something was wrong. Then we got the call that answered the nagging feeling; one of the tests, something called celiac, was positive. About a month later it was confirmed through an endoscopy that she had celiac disease. Again, I am not a doctor, but the cyclical vomiting was like her body would handle the gluten she was eating as best it could, until it overloaded, and then it would have to get it out as fast as possible. Once she emptied her gut, the pattern would start all over again. The transition to the diet was not easy, especially back then, and it took a good year for her to feel better. I am not sure if it took that long for the intestines to heal, or due to the lack of information, she occasionally, accidentally got gluten. She has been strictly gluten free for almost ten years now. She is highly sensitive to gluten, which has made college very challenging. (You can read more about her experience here: Eating Gluten Free at College). She does best on a diet of naturally gluten-free food that is cooked in my dedicated gluten-free kitchen. When she does get exposed her symptoms are pretty similar to how she felt as a child. She does not vomit anymore but she gets the same overall, lethargic feeling of just not feeling good. She gets headaches as well and a stomachache. While it took us years to get a diagnosis for my oldest daughter and to get her healthy again, my middle daughter’s journey to becoming gluten free was even less clear. When my oldest daughter was diagnosed with celiac disease, everyone in the family was tested and everyone came back negative for celiac. So I continued to feed gluten to my other children. Even at that young age, basic schoolwork was starting to prove challenging. She would reverse letters in her spelling words, had sloppy handwriting and seemed to take longer to learn some basic things. She was also still suffering from a lot of minor colds, sore throats etc. In fifth grade she had such a bad stomachache that we spent the night at the Emergency Room because they were worried it was her appendix. The diagnosis was extreme constipation, which they prescribed two months on Miralax as the treatment. Once again the test for celiac disease was negative. Not satisfied with the answer to take Miralax and “eat an apple a day,” I took her to a naturopath to see if we could find some more conclusive answers. The naturopath ran the ELISA screen which came back allergic to dairy and a small reaction to gluten. We also ran a gene test that showed she has one of the celiac genes. Taking her off dairy seemed to answer some of the problems, as she stopped suffering from constipation. By sixth grade the stomach issues were under control, but she was still having recurring minor illnesses. She missed around 17 days of school in both fifth and sixth grades. But more pressing at that point was the living-in-the-clouds issue. She seemed to be lost in her thoughts and it was really impacting her schoolwork. The school recommended testing for learning disorders and inattentive ADHD. I scheduled the testing but at the same time that little voice in the back of my head started whispering – gluten. Yes, gluten, take her off the gluten. The one piece of advice that I give moms is to follow their instincts. No one knows your kids like you do and if you think something is going on, then follow your guts. So I took her off gluten. The result was a miraculous turn around in her “with-it-ness.” She literally landed back on earth. Her grades went up, her eyes started to sparkle a little more and she became a very “normal” kid. She is in High School now and still eats gluten free. If she accidentally eats gluten, she will feel bad. She will get a small stomachache. Even more evident, it makes her very tired and spacey and her eyes literally glaze over. My journey to a gluten-free life is probably the most vague of all. I don’t remember having stomach aches as a child or really ever being that sick. It was not until I graduated from college and started working that I developed really terrible stomachaches. The doctors never did any formal tests, but they diagnosed me with ulcers and treated it with Tagamet. Even though I had a very healthy appetite, I was extremely thin. I used to joke that food seemed to just move right through me. I also did not have the level of energy that I have now. I also had an extremely hard time getting pregnant. For both of my daughters, I had to take fertility drugs and it took years to conceive them. When our oldest daughter was diagnosed with celiac disease, I went gluten free to support her new diet. After eating gluten free for a week, I suddenly felt better than I had my entire life. I first noticed how calm I felt, both physically because my stomach was finally feeling better, but also more emotionally calm and stable. Then my energy level skyrocketed. I have so much more energy and, as long as I don’t accidentally get gluten, I never have a headache or a stomachache. Truly, I have never felt better in my life. Subsequent testing showed that I carry the gene for celiac disease. Not wanting to get back on gluten to have further testing, I have never been officially diagnosed with celiac. I eat 100% gluten free. And, in all honesty, regardless of any tests results, gluten makes me feel awful, so why would I ever eat it again? That is my family’s story about our journey to living gluten free. To find out more about us, visit my website at Gluten Free Mom.com.